GCALL5 - 1 pt/s For just 1 Rewards Point, you get additional 5 minutes of call to Globe/TM, valid for 1 day! FBMES1D - 1 pt/s Redeem FBMES1D for 1-day access to FB Messenger! Data charges may still apply. GSURF5 - 1 pt/s Redeem this reward to get 5MB of mobile internet, valid for 1 day. GC5 - 1 pt/s Enjoy 10 texts and 2 minutes of calls to Globe/TM numbers, valid for 1 day, for only 1 point! GC3 - 1 pt/s Use your 1 point to send 5 SMS and make a 1 minute-call to Globe/TM numbers for only 1 point, valid for 24 hours. GTXT1 - 1 pt/s Use your 1 point to send 5 SMS to Globe/TM numbers, valid for 1 day. FB1D - 2 pt/s Enjoy unlimited Facebook access for 1 day, for only 2 points! TWITTER1D - 2 pt/s Redeem this to get 1-day access to Twitter. Data charges may still apply. INSTAG1D - 2 pt/s Redeem INSTAG1D for 1-day Instagram access. Data charges may still apply. VIBER1D - 2 pt/s Redeem VIBER1D and get all-day access to Viber for 1 day, for only 2 points! GC10 - 2 pt/s Enjoy 25 texts and 5 minutes of call to Globe/TM, valid for 1 day, for only 2 Rewards Points! GOSAKTO10CALL - 2 pt/s Redeem GOSAKTO10CALL and share sweet moments on the phone with 10 minutes of call to Globe/TM, valid for 1 day for only 2 points! GOSURF10 - 2 pt/s Surf Facebook and enjoy all your other favorite apps with 40 MB of mobile internet! Valid for 1 day for only 2 points! GOSAKTO10TEXT - 2 pt/s For only 2 points, redeem GOSAKTO10TEXT and get 50 texts to all networks valid for 1 day. GCALL10 - 2 pt/s For just 2 Rewards Points, get additional 12 minutes of calls to Globe/TM, valid for 1 day. SULITXT15 - 3 pt/s Share the latest updates with your Globe and TM friends. Send 100 messages to them without the need to reload! Valid for 1 day, for only 3 points. GCALL15 - 3 pt/s Stay updated on latest gimiks and meet-ups with friends using your 3 points! Enjoy additional 20 minutes of calls to Globe/TM, valid for 1 day. GOSURF15 - 3 pt/s Surf, chat, and check out the latest trends online with 40MB surf with GoSURF15, valid for 2 days - 3 points only! GCOMBO20 - 4 pt/s Call and text everyone with this combo of 80 texts and 5 minutes of calls to Globe/TM, valid for 1 day for only 4 points! GCALL20 - 4 pt/s For just 4 points, redeem GOCALL20 and get 30 minutes of calls to Globe/TM, valid for 1 day. GOSAKTO17 - 4 pt/s Redeem 50 texts + unlimited calls to Globe/TM with GOSAKTO17 and make them feel you're always there. GOUNLI20 - 4 pt/s For only 4 points, get unlimited calls to Globe/TM, 20 texts to all networks + 15MB of surf—valid for 1 day. UNLI20 - 4 pt/s For only 4 points, enjoy unlimited texts to Globe/TM - valid for 1 day! VIBER7D - 5 pt/s Bring all the fun conversations with friends on Viber! Exchange cute stickers and hilarious GIFs! Redeem VIBER7D and get all-day Viber access for 7 days with VIBER7D! FB7D - 5 pt/s Share that new promo in your breakfast place or your new favorite beverage! Update your friends on what's hot around the block with all-day Facebook access for 7 days! INSTAG7D - 5 pt/s Redeem INSTAG7D for 7 days Instagram access—5 points only. TWITTER7D - 5 pt/s Get 7-day access to Twitter! Data charges may still apply. POGO10 - 5 pt/s It's time to chase pocket monsters! Redeem POGO10 for only 5 points for 100 MB of Pokemon GO access valid for 1 day. GOUNLI25 - 5 pt/s Stay present in all the happenings with unlimited calls and texts to Globe/TM + unlimited texts to all networks + FREE Viber, valid for 1 day. FBMES7D - 5 pt/s Send sweet nothings and make someone feel loved. Get 7-day access to FB Messenger! Data charges may still apply. GCOMBO30 - 6 pt/s Send 100 text messages and 8 minutes of calls to Globe/TM, valid for 1 day, for only 6 points! GOSURF30 - 6 pt/s Surf, tweet, e-mail, and browse Facebook all you want for 1 day! Enjoy all these with 150 MB of mobile internet for 2 days - 6 points only! YOUTUBE10 - 7 pt/s 100MB of YouTube streaming valid for 1 day. WAZE1D - 7 pt/s Waze access of 100MB valid for 1 day. WECHAT1D - 7 pt/s WeChat access of 100MB valid for 1 day. POGO15 - 7 pt/s Catch all the Pokemons you want with 100 MB of Pokemon GO access by redeeming POGO15 for only 7 points, valid for 2 days! SURF1D - 8 pt/s Access all sites and apps with 1GB data for 1 day. GCOMBO40 - 8 pt/s Call and text to your heart's content--keep in touch with your family, barkada, and special someone! You have 100 texts and 25 minutes of calls to Globe/TM for 1 day, for 8 points. UNLI40 - 8 pt/s Enjoy unlimited texts to Globe/TM with Unli40, valid for 2 days. INSTAG15D - 10 pt/s Redeem INSTAG15D for 15-day access to Instagram. Data charges may still apply. HOOQ59 - 10 pt/s Laugh at a new comedy flick or marvel at the glory of a classic drama with HOOQ59. Get 300 MB of allocation for HOOQ for only 10 points, valid for 7 days. FB15D - 10 pt/s Redeem FB15D and know all the exciting status updates with an all-day Facebook access for 15 days! TWITTER15D - 10 pt/s Exchange snaps or be part of a current trending topic! Redeem TWITTER15D and get 15-day access to Twitter. Data charges may still apply. GOUNLI50 - 10 pt/s Witness every moment by staying connected with unlimited calls to Globe/TM + unlimited allnet texts + 50MB of surf, valid for 3 days. FBMES15D - 10 pt/s Be in the loop with 15-day access to FB Messenger! Data charges may still apply. VIBER15D - 10 pt/s Send sweet notes with adorable Viber stickers! For just 10 points, get all-day Viber access for 15 days with VIBER15D and make that small talk a conversation to remember. YOUTUBE20 - 11 pt/s 200MB of YouTube streaming valid for 2 days. HOOQ149 - 15 pt/s Watch a HOOQ flick anytime, anywhere with HOOQ149. Get 300 MB of allocation for HOOQ valid for 30 days—15 points only! GOUNLI95 - 19 pt/s Unli calls to Globe/TM + Unli all net texts + 100MB data valid for 7 days. GOSURF99 - 20 pt/s Enjoy your favorite sites and share inspiring posts on Facebook with 200 MB of mobile internet! Enjoy all this for 30 days for only 20 points! GOWATCH29 - 25 pt/s 2GB data allocation video streaming apps - YouTube, HOOQ, Netflix, Tribe, Cartoon Network, Disney and NBA, valid for 1 day. POGO99 - 25 pt/s Get on your feet and go catch 'em for a whole month with 1 GB of Pokemon GO access—25 points only. GOWATCH99 - 30 pt/s 2.5GB data allocation video streaming apps - YouTube, HOOQ, Netflix, Tribe, Cartoon Network, Disney and NBA, valid for 3 days. SNAP7D - 30 pt/s Snapchat access of 600MB valid for 7 days. HOOQ299 - 30 pt/s Get access to feel-good films with HOOQ299 and get 1 GB of data allocation valid for 30 days—30 points only. GOSURF299 - 60 pt/s 1.5GB data with free 1GB data for app of choice, valid for 30 days. HOOQ499 - 60 pt/s Watch your favorite HOOQ films in a few clicks with 2 GB of data valid for 30 days — 60 points only. SMAC100 - 130 pt/s More shopping means more fun! Convert 130 worth of Rewards points to 100 SM Advantage points, which you can use as cash to pay for more items. 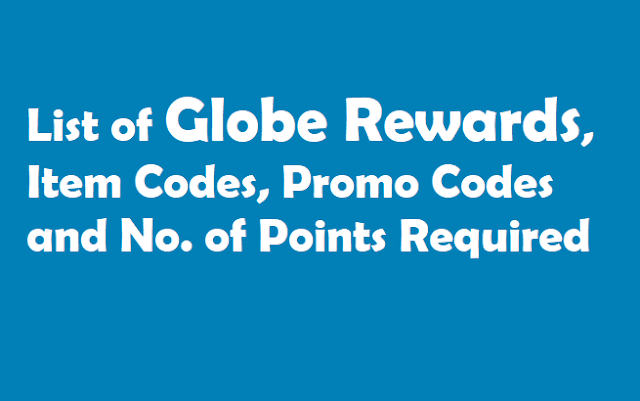 SMAC200 - 260 pt/s Make shopping more fun when you redeem your Globe Rewards points for SM Advantage points. Turn 260 worth of Rewards points to 200 SMAC points which you can use when you shop at SM! SMAC500 - 650 pt/s More SM Advantage points mean a more rewarding shopping experience at SM. For 650 worth of Rewards Points, you can now get 500 SM advantage Points! SMAC1000 - 1300 pt/s Treat yourself to a shopping splurge with your Globe Rewards points! Convert 1, 300 worth of Rewards Points to 1,000 SM Advantage points and shop to your heart's content. You may even redeem via SMS by texting REDEEM [space] CODE and send to 4438, or by dialing *143#. Text GIFTITEM CODE [space ] 10-digit mobile number and send to 4438. Example: GIFT GOSURF99 9970000000 and send to 4438.